Its been a long long time. I've really really missed my Stand Up Paddle SURFING passion. Not that anybody really cares but life has changed things up (nothing bad just different, don't lose any precious sleep over it). 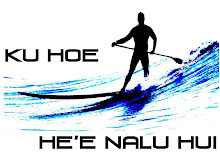 However, lately I've been getting more time in the SUPSurfing pocket and enjoying the nalus again. So I guess I'll be writing a little more and sharing some online SUP aloha. Oh and by the way the surf is pumping'.... laddahs!